A really good example to get started with Game Center Turn Based match's is Beginning Turn-Based Gaming with iOS 5 by Jacob Gundersen. Some API's have been changed in iOS 6, but it is still a really good tutorial. This was my first real experience working with the Turn Based API, and I wish I would have know the following going into the project. It turns out that a match participant may "pass" the turn (baton) to themselves. I had assumed that wouldn't be allowed, but it turns out the API does allow it, and it definitely simplified some of my game play logic. The only catch is that other players won't be notified of the changes to the Game State when you pass the game baton to yourself. I thought that when a player timed out their participant matchOutcome would get set to GKTurnBasedMatchOutcomeTimeExpired. However, it turns out you have to determine this condition yourself and set the appropriate matchOutcome for the participant. Another interesting case is when a participant is in a matching state. The timeout isn't applied against that unmatched participant. iOS 6 depreciated the old authenticateWithCompletionHandler and replaced it with GKLocalPlayer.localPlayer.authenticateHandler. They changed the block callback a bit, but other then that it looked equivalent. However, the authenticateHandler in iOS 6 won't present the login view if the user cancels it. I realize game center will auto lockout an app after 3 cancel attempts, but I'm talking about just 2 attempts. If they cancel the login, they have to leave the app and come back before Game Center will present the login even through the authenticateHandler is getting set again. I was able to workaround the issue by continuing to use the depreciated authenticateWithCompletionHandler. 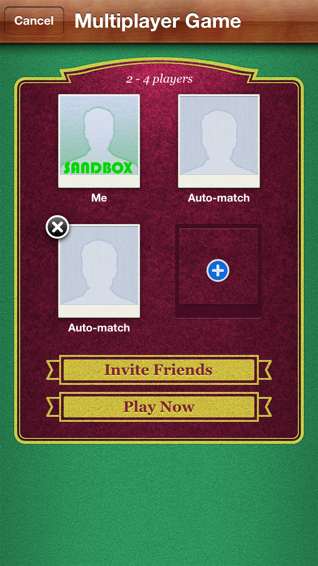 The reason this is important for Euchre HD is that it requires Game Center for multi-player. The app tries to authenticate to game center on launch, but if the user cancels we don't ask them at launch again so they won't get nagged. What we do is show a Game Center Login button if they aren't logged in when they select multi-player. One problem we have found is that if you have a variable number of players and then start a match with "auto-match", Game Center will start the match with the "minimum" number of players. It does this even if the Game Center match-making UI is showing auto-match spaces for more then the minimum number of players. Let me try and explain this a bit better. One thing we do in Euchre HD is to allow people to pick the number of human players they want in a match. They can pick from 2 to 4 humans. Euchre is of course a 4 person game, but we fill in the remaining spots with computer players. Game Center provides a really nice interface for forming a multi-player game. Here is an example, that shows a 2-4 player game. The play can add or remove players players as long as they stay within the defined min/max limits. However, if the player selects "Play Now" and "Auto-match" is selected a match will only be formed with the minimum number of players. 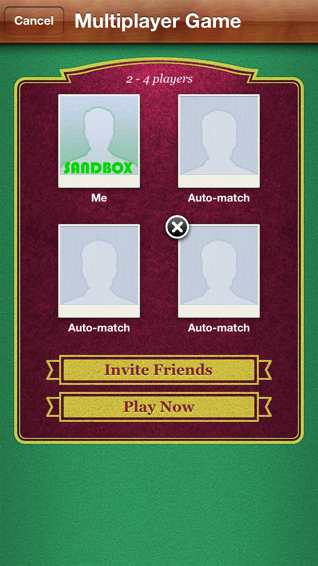 In the above example, even through 3 players are being shown as Auto-match, Game Center will only start a 2 player match. Here is the example code showing how the request is created. As anyone else encounter this issues? Any good suggestions on how to handle it? I would rather not write my own custom matchmaking interface. Please feel free to follow me on twitter at @fivelakesstudio. I would love to hear about your experiences Game Center. I hope this was helpful. Shawn, thanks for the link. I hope apple fixes it. how to set data, view match when it is not our turn ?